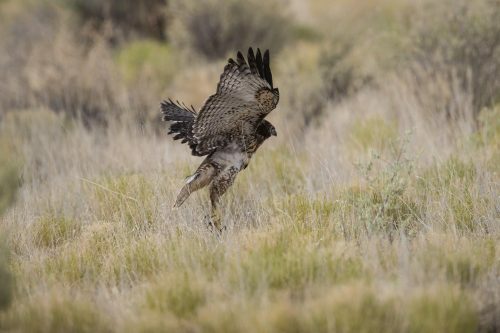 A Young Red-tailed Hawk’s Saving Grace /Hawks Aloft Inc.
For two years, long-time Hawks Aloft friend and volunteer Larry Rimer monitored a Red-tailed Hawk nest site on the western edge of Rio Rancho, butting up to the escarpment near a network of large, high voltage power lines. 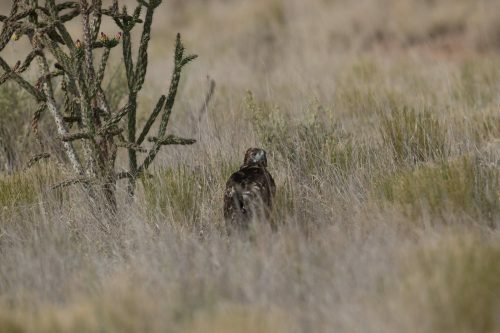 When the nest revealed just two nestlings this year—as opposed to three the previous year—Larry paid closer attention to the site, visiting it at least weekly to “marvel at their beauty and study their behaviors,” as he put it. On one recent auspicious Friday morning, Larry decided to check on the nest for the last time before heading out on a week-long research trip. The chicks “were close to fledging and [I] was hoping to see them fly,” he explained. Yet, when he arrived, only one of the chicks was in the nest. He lingered, observing the remaining nestling, realizing that it was not yet ready to fly, and worrying over what had happened to the missing chick. Maybe it had been predated by a Great Horned Owl? Larry kept his vigil for more than two hours before deciding to head home. “Just then [I] noticed out of the corner of my eye something fluttering down at the base of one of the huge poles,” he explained. 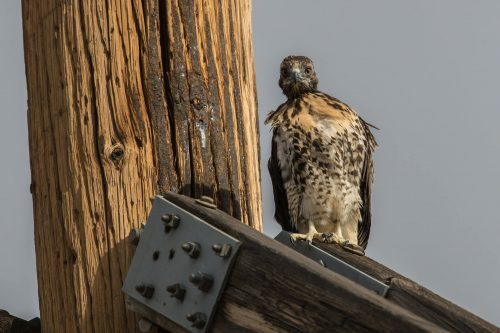 There, mired in the tar applied to the wooden electrical poles to keep them from rotting, was the other young Red-tailed Hawk, his feet and chest stuck in the now hardened tar. The previous day there had been a storm, and Larry’s best guess is that the gusts had knocked the bird from his nest and into harm’s way. “I couldn’t believe my luck in being in the right place, looking in the right direction, at the right time to find him,” Larry said. 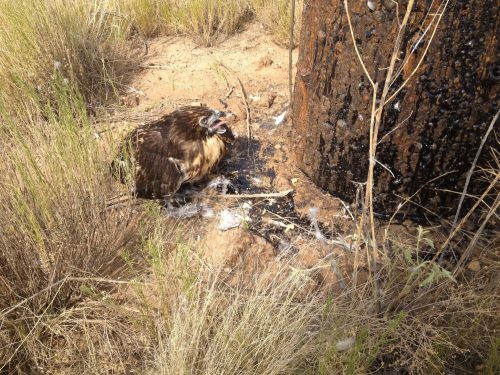 The young Red-tailed Hawk stuck in tar. Photo by Larry Rimer. 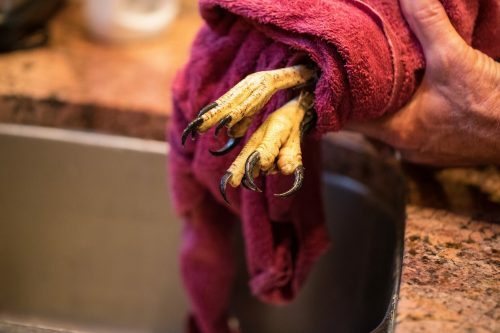 The hawk’s feet, covered in tar, before cleaning. Photo by Kariana Jones. Larry called Hawks Aloft where he was advised to take the bird directly to Petroglyph Animal Hospital. Larry worked patiently under the watchful gaze of the adult Red-tails until the youngster was free. He then transported it Petroglyph, where Dr. Kariana Jones treated the bird for dehydration, and gave him an initial cleaning. 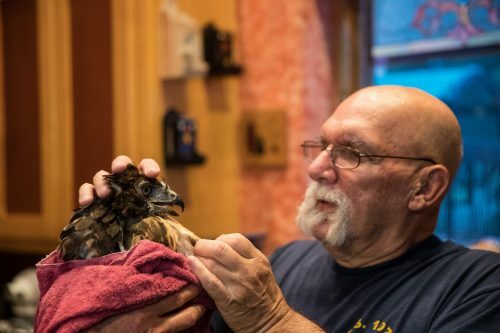 Later in the day, the bird was taken to a Hawks Aloft rehabilitator, Jim Battaglia, who, along with Larry, Steve Elkins, Tony Giancola, Gail Garber, and Dean Balmer continued cleaning the bird with mineral oil, Dawn dish detergent, and Goo-Be-Gone. Jim Battaglia hard at work. Photo by Tony Giancola. 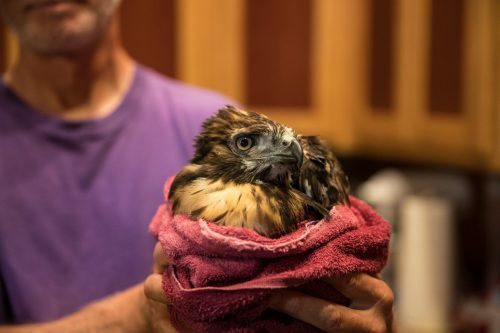 After being thoroughly cleansed of tar, the young hawk recuperated overnight. The following morning Larry, along with his wife Kim, Steve Elkins, Tony Giancola, and others, took the bird back to his nest site and released him. 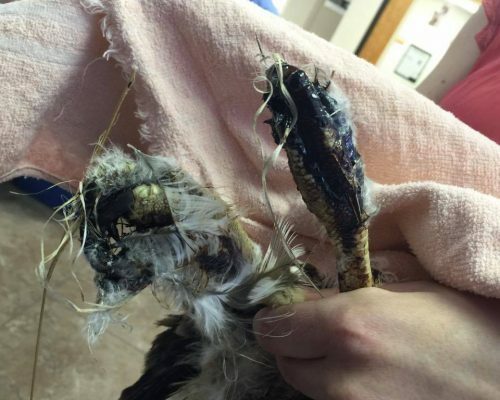 He lingered on the ground before climbing a nearby fence pole, all the while calling for his parents. After a time, the parents showed up with a huge rabbit for breakfast and the young hawk called out joyously. He flew nearly 30 feet to a nearby post, and at that time, Larry left the family to their privacy. The Red-tailed Hawk just after release. Photo by Tony Giancola. The hawk’s sibling looks on. Photo by Tony Giancola.